Dioramas are always cool, even simpler ones like this. 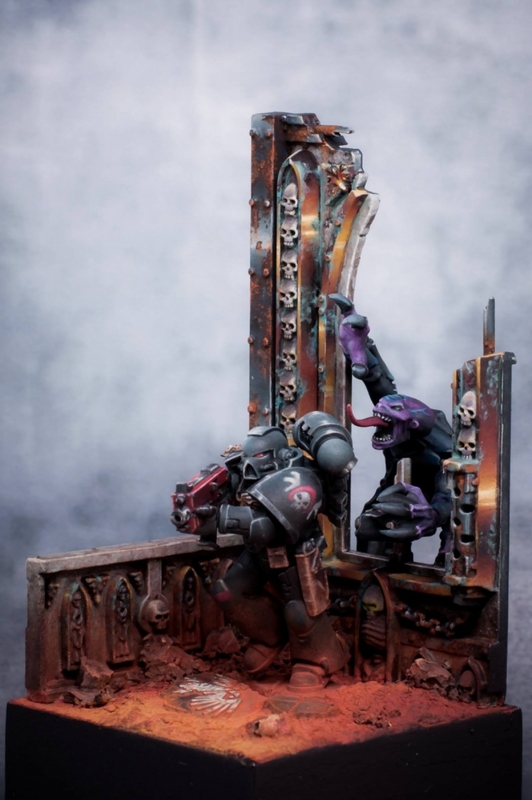 I don't think there's much conversion in here, but the placement of the models is great and they tell a story, which is all you really need it to do. What stood out to me on this right away was the almost pastel look to the colors. Everything is very light, soft, and a little washed out. 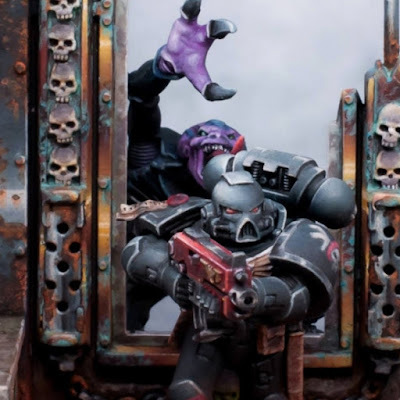 It gives it a very unique look, especially on the Space Marine since his armor is black. I would say it almost has a dream like quality to it. Everything is smooth and crisp, with the colors on the Genestealer really standing out due to their saturation. I like the choice in color for the ground too. The reddish earth frames everything well without distracting too much from it. It also lets the dust on the boots of the Marine and the building around him stand out more. The non-metallic metals on the building are done nicely, and even work well with the weathering, which I think can be a little hard to pull off. It looks suitably run down, like this is an old outpost out in the desert that hasn't been check on for awhile. Everything works really well together and I'd love to see more dioramas in this style. Be sure to check out more views of the model on Putty and Paint and show the artist some love if you like it.